Liverpool have been charged by UEFA after Manchester City's team bus was pelted with bottles and cans ahead of their Champions League defeat at Anfield on Wednesday evening. Disciplinary proceedings regarding the setting-off of fireworks, throwing of objects, acts of damage and crowd disturbances will be dealt with by UEFA's control, ethics and disciplinary board on May 31. City coach Manel Estiarte posted footage from inside the team bus which shows numerous objects hitting the coach to highlight the "unacceptable" behaviour of fans. Manchester City manager Pep Guardiola offered a sarcastic response to security staff after their coach sustained a significant amount of damage. 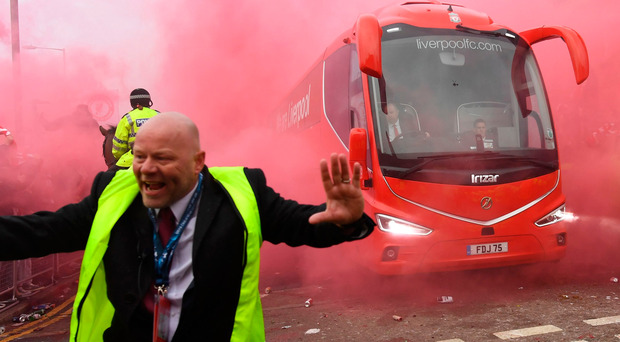 At least one window was smashed on the journey through streets filled with thousands of fans, some throwing flares and smoke bombs, and a replacement vehicle had to be found for the trip home after the 3-0 loss. In footage obtained by Spanish television station Gol, Guardiola appeared to be less than happy with the arrangements made for their arrival. Liverpool, who issued a statement of apology on Wednesday, have not announced security plans for next Tuesday's return leg at the Etihad Stadium.